As the global leader in brand protection, MarkMonitor provides advanced technology that protects the world's foremost brands. As widespread unauthorized product distribution reaches a new level of complexity, brand owners are finding themselves mired in a “whack-a-mole” battle against fraudsters. Unauthorized sellers are adept at setting up new sites and marketplace listings almost as quickly as they are taken down. Meanwhile, their multi-level marketing networks allow them to hide behind layers of anonymity. 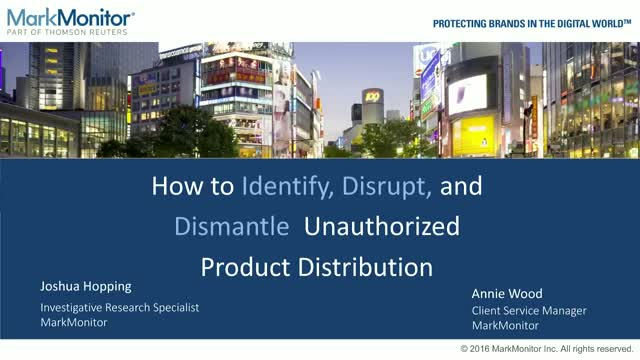 Please join MarkMonitor brand protection experts Josh Hopping and Annie Wood as they discuss how to generate actionable intelligence and leverage investigative tactics to disrupt and dismantle infringing online networks at their source. With social media consumption at an all-time high, companies must be vigilant against burgeoning cases of brand impersonation, false association and improper partner compliance in the social channel. Customers expect an authentic and seamless brand experience, and even one negative experience can have a damaging impact on your social reputation – and your bottom line. Please join MarkMonitor® Brand Protection experts Kyle Sale and Zachary Wolf as they discuss the most common types of brand abuse found in social channels and best practices for protecting your brand across social and other digital channels. Online marketplaces in Asia are a fast-growing channel for counterfeit activity and brand abuse. What are the complexities of protecting your brand in these marketplaces and how can you drive a successful enforcement strategy? Please join MarkMonitor® Brand Protection expert Trevor Robbins as he reveals key strategies for successful monitoring and enforcement in Chinese Marketplaces.